They section off the cages as if to say these are our wild animals. We hold them in the short corridor, the long corridor. We got a variety of animals that are just as dangerous, just like the zoo. The animals do not have a voice; therefore, us overseers control the narrative, explaining to the world why we have to hold these animals in cages, because if we let them out, they will go wild or wouldn’t know how to survive in the free world on their own. So we hold them in these animal cages in order to tame them, just like at the zoo. We do charge a fee to hold our animals. It’s Big Business in Amerikkka. For minding “our” animal cages, we get $70,000 annually in tax dollars for our animals held in solitary confinement. But in our tame animal cages on General Population, we get $53,000 annually, and this is for each animal we have in a cage. This is why we must continue to build more prisons-zoos, especially solitary confinement cages in the 21st century, to build on our profits. But we have to maintain a surplus of animals for our Prison Industrial Slave Complex Zoos, by manifesting as well as manufacturing 21st century slaves throughout the United States. Imprisoning “animals” will produce an output of animals, who will perpetuate the practice of savagery … toward serving our interest. 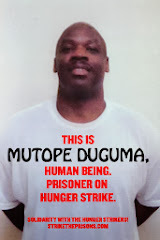 Mutope Duguma is a 21st century prison slave, as sanctioned by the 13th Amendment of the U.S. Constitution.